Everything in Times Square screams “Look at me!” That’s why it’s weird to find a place as well hidden as XVI. The unobtrusive door is guarded by two men with walkie-talkies and a clipboard. I got the sense that it was pretty exclusive and even if people wanted to check it out they might not get in. When you get past the clipboard you walk through a long hallway until you come to an elevator. The elevator operator (who knew they still exist?) takes you directly to the 16th floor. The initial effect is pretty breathtaking. 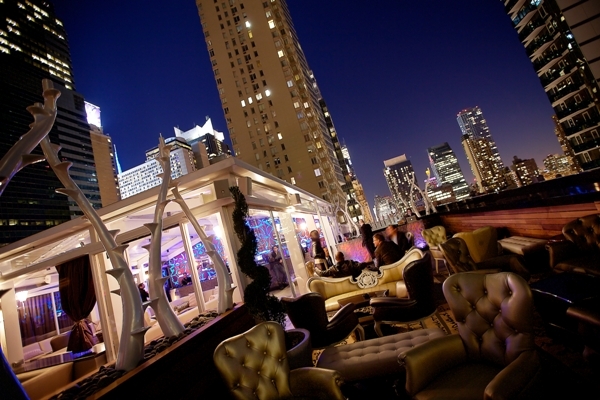 The club is on a half-covered open rooftop with a pretty impressive view. There isn’t alot to look at in the neighborhood apart from some nice hotels but just looking out over the city is enough for me. This isn’t the type of place you pop into to sit at the bar and grab a drink. Couches and tables are arranged in such a way to promote relaxing with a date or a group of friends. It’s nice to be able to be outside in pleasant weather and still sit on comfortable furniture. The mood is set by long artificial branches holding little lights at different levels placed all around the club. This plus the lights of the surrounding buildings kept it at the perfect level for close conversation or taking in the surroundings. Not offensively bright, not frustratingly dim. While lounging, XVI had a list of their own specialty cocktails to sip on. First I had the Brooklynite which was delicious. It’s sort of a sweet and sour rum drink. Afterwards, I tried the New York City Sour. It combined bourbon with lime and red wine which I thought was an inspired move. I only found the drink to be so so as a whole but I’m sure there are people who will love it. At $18 a piece though you probably wouldn’t want to make this your one stop of the night. It would be a nice way to cap a night off though. That is if they didn’t make last call at midnight. XVI certainly cultivates a feel. It’s welcoming but not too welcoming. It seems exclusive and classy but then again there was a guy walking around dressed like he was on his way to a New Found Glory concert. Still, it’s a nice place to get a well made, tasty drink and enjoy a mellow night in a comfortable atmosphere. We have to try out XVI! The view seems spectacular and the atmosphere–on point! 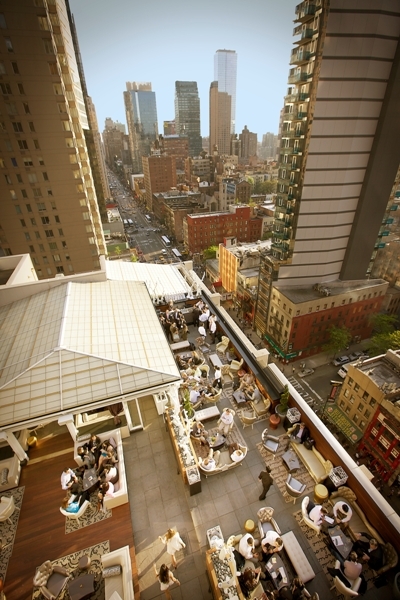 We’re always up for trying out new roof bars, especially on hot summer nights. This sounds like a Midtown West gem.